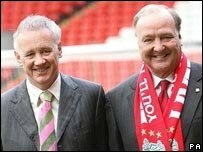 Liverpool chief executive Rick Parry has hit out at owner Tom Hicks' attempts to get him to resign. Hicks wrote a letter on Thursday calling for Parry to stand down, just two days after the club reached the Champions League semi-finals. Parry said he has yet to see the letter and added: "I shouldn't be the story this week. "The story should be the team and this is offensive to the manager, players and fans." On Tuesday, the Reds beat Arsenal to go through to the final four of the Champions League for the third time in four years. But there was further disruption off the field in a season that has been disrupted by internal wrangling in the boardroom. Parry added: "I haven't seen the letter so you guys know more than I which says something. "In a week in when we've had a great European triumph we should be talking about that. It is just more dirty linen being washed in public. "No individual, certainly not me, is bigger than the club. The club will be fine but once again it shows there's a little bit of a lack of unity at the top. I'm just getting on with the job." The letter is thought to have been prompted by a recent interview in which Parry urged Hicks and fellow co-owner George Gillett to end their dispute. Gillett backed Parry and stressed the full board would have to approve any removal of the chief executive. He was quoted in the Liverpool Echo as saying: "Rick Parry retains our full support. "Any decision to remove him would need the approval of the full Liverpool board which, it should be remembered, consists of six people - myself, Foster [Gillett's son], David Moores, Rick himself, Tom Hicks and Tom junior. "We have not seen the document in question and we were not party to it. We are not able to comment on the detail because we have not seen it. But I would reiterate that Rick retains our full support." BBC Radio 5 Live football correspondent Jonathan Legard said: "This is just the latest blow in this ongoing saga where you have these two owners not even talking at all. "I would say it's not going to be settled before the end of the season. "As I understand it there is an inevitability about what's going on and by the start of next season Liverpool should be under new ownership. "That surely has to be the hope of every Liverpool fan because at the moment all the glory on the pitch is in danger of being overshadowed by this ongoing saga, which is doing credit to absolutely no-one." Hicks is presently thought to be trying to put together a financial package to attempt to buy out his American partner. But Gillett has said he will not sell any of his 50% share to his partner, while Dubai International Capital, which has had negotiations with both parties in the past, insists it would "still love to own" the club. Liverpool cancelled their weekly press briefing ahead of the game against Blackburn at the weekend.